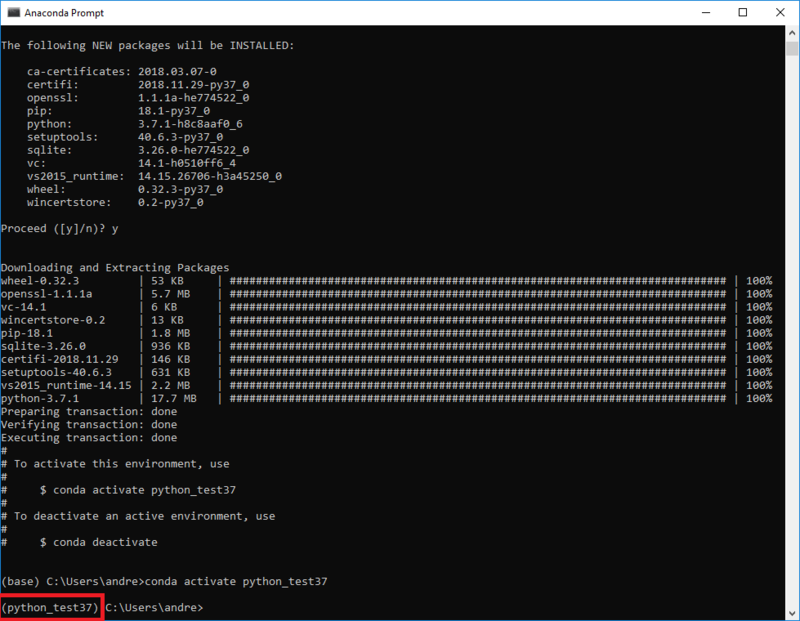 In this post, part 3, I will cover virtual Python environments. I’ll explain what a virtual environment is and show you how to set one up using Anaconda. Why use a Virtual Environment? 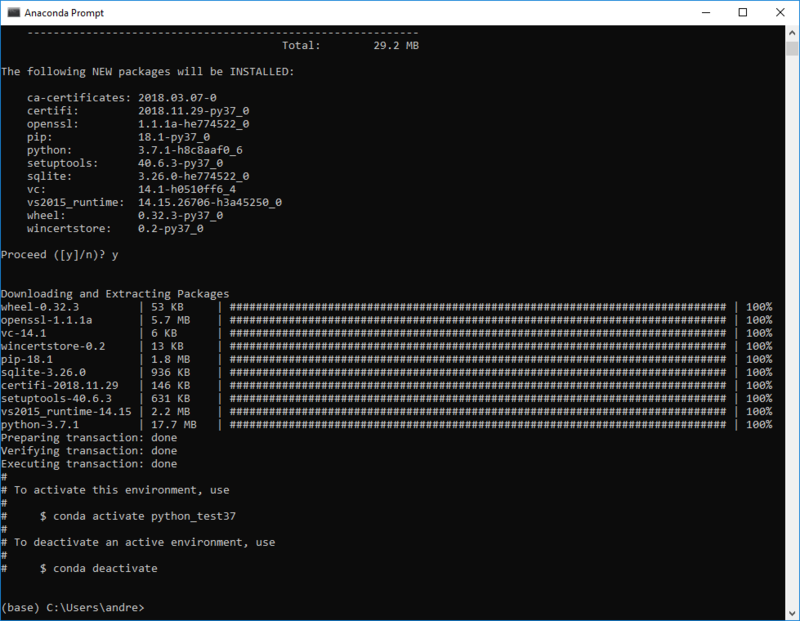 A virtual environment will allow you to try out new Python libraries without the risk of damaging or altering your main or base Python environment. This could be best practice if you have a working development environment and require several test beds, perhaps containing different versions of Python and/or different versions of various libraries. You could keep your base setup stable by testing new releases of libraries in a virtual environment. What do I mean by that? I mean you can check existing code to ensure it still works in the way you expect. 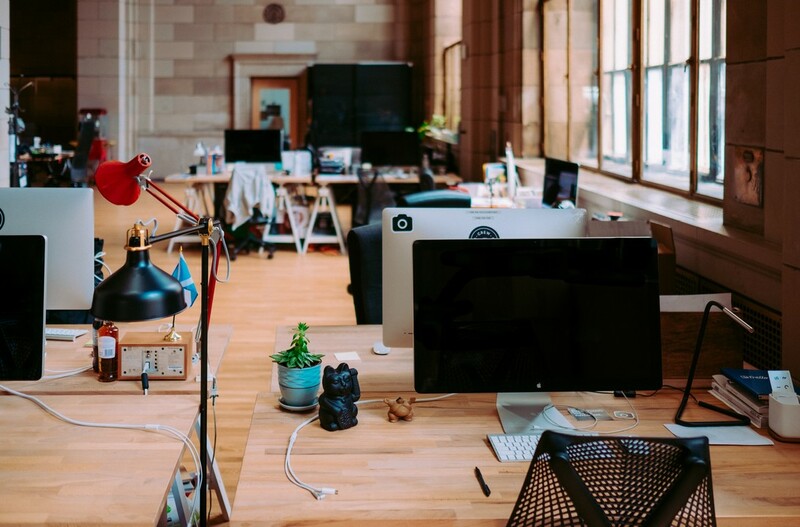 A virtual environment is a tool that helps to keep dependencies required by different projects separate by creating isolated python virtual environments for them. This is one of the most important tools that most of the Python developers use. The key word is isolated. Each virtual environment that you create will have its own dependencies, irrespective of any other Python environments you may (or may not) have. Oh, and you are not limited to the number of virtual environments you have. You are only limited by the hard disk space of your computer. A brief recap on this blog series… Anaconda is an Open Source distribution of Python (and R) with the overriding aim to make using Python as simple as possible. While there are other ways to install Python, I am using Anaconda and at this point I will assume that you are too. I will assume that you have the latest working version of Anaconda installed. If not, re-visit part 1 here. Type ‘y’ and press return to create your new environment. In this case it will install Python 3.7. The downloading of the packages will begin and then will install. You should get a message saying that the installation has been installed correctly and helpfully you will receive the prompt telling you how to activate this new virtual environment. and the Python environment will be working. Test by importing one of the standard libraries, such as ‘os’. If all is working then no errors should be returned. Continue to install different packages as needed. You can access Jupyter Notebook without having to install anything else. The same applies as in part 2, available here. There is no need to specify the environment name. With this command you will return to (base), the default environment. What has been installed and how do I get rid of it? Finally, let’s take a quick look at what has been installed. On my machine (where my installation of Anaconda resides) I have a folder called env that holds all my virtual Python environments. My location is …\Anaconda3\envs. If you go and have a look you will find a lot of files (dll’s, and .py files mainly). 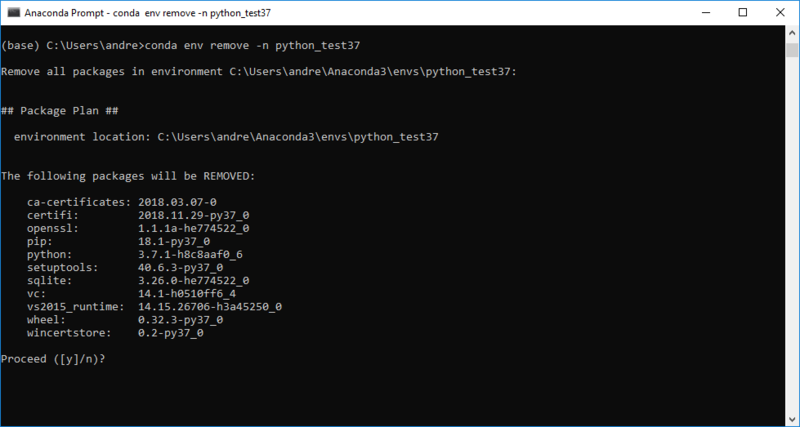 By selecting ‘y’ and hitting return you will remove the virtual Python vnvironment in Anaconda. 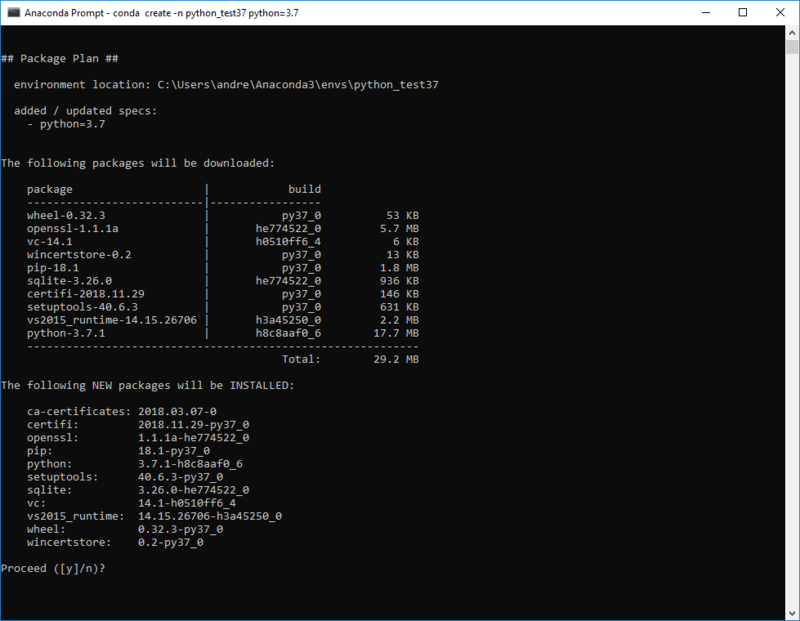 In this third part we have built on our installed Anaconda Python environment from part 1 and created a virtual Python environment. Build a virtual environment every time you wish to test a new library/package, or if you wish to use different Python versions (and library versions), and/or if you wish to maintain a stable development environment without upgrading packages when you are not 100% sure of the impact on your existing Python setup/code. This entry was tagged beginners, python, virtual environment, workflows. Bookmark the permalink.